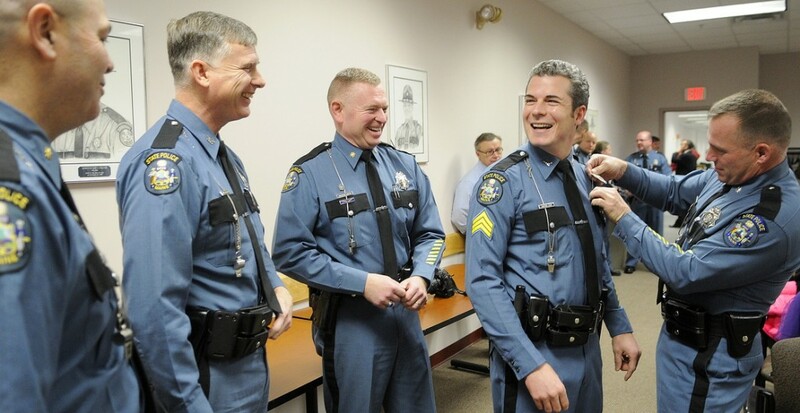 State Trooper Jon Leach, second from right, laughs with Col. Robert Williams, second from left, and Major Gary Wright, left, and Major Christopher Grotton as Lt. Col. Raymond A. Bessette replaces his shield with a sergeant’s badge during a promotion ceremony Monday for Leach at the Department of Public Safety. Leach, of Manchester, was recognized in February 2011 for fighting and apprehending an erratic driver while Leach was on sick leave following shoulder surgery, and he was recognized again this July for helping to arrest two men involved in a Chelsea kidnapping. Leach, 38, will now supervise the statewide firearms unit, instructing recruits and training troopers on weapons.